“It’s another important reason to follow the guidelines to limit the intake of red and processed meat,” said Marjorie McCullough, the study’s lead author from the American Cancer Society in Atlanta. While the new study can’t prove eating red or processed meats - such as beef, hot dogs and sausages - causes colon cancer deaths, previous studies have found that eating the meats is tied to an increased risk of developing the cancer. There’s less evidence, however, on how people’s diets after colon cancer diagnoses affect their chances of survival. The U.S. National Institutes of Health estimates that about 143,000 Americans will be diagnosed with colon and rectal cancers in 2013, and about 51,000 people will die from them. For the new research, McCullough and her colleagues used data from a different study on 184,000 Americans who didn’t have cancer between 1992 and 1993, and who were periodically asked about what they ate. After excluding people, who had - among other things - multiple types of cancer, unverified diagnoses and missing information, the researchers had data on 2,315 men and women who were diagnosed with colon or rectal cancer between the start of the study and June 30, 2009. Overall, 966 of them died between the start of the study and December 31, 2010. 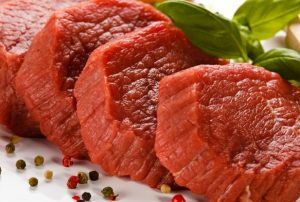 The researchers found no link between how much red or processed meat a person ate after their diagnosis and their risk of death, but the amount of meat a person ate before their diagnosis was tied with their risk of dying during the study. About 43 percent of the 580 people who ate about 10 servings of red or processed meat per week at the start of the study died during the follow up period. That compared to about 37 percent of the 576 people who ate about two servings per week. The researchers also found that people who consistently ate more red or processed meat before and after their colon cancer diagnosis were more likely to die from that cancer during the study, compared to those who at the least before and after diagnosis. Dr. Jeffrey Meyerhardt, who wrote an editorial accompanying the new study in the Journal of Clinical Oncology, said it’s possible that the link between red and processed meats and colon cancer comes from cancer-causing compounds found in cooked meat or preservatives. “The primary message is a confirmation that increased intake of red or processed meat can have detrimental effects on the development of colon cancer, the type of cancer and other health effects of patients in the long term,” Meyerhardt, a gastrointestinal oncologist at the Dana-Farber Cancer Institute in Boston, said. McCullough said about three or four servings of red or processed meats per week is a good target for people. “We’re not saying people need to be vegetarians. It’s really just limiting intake and making it more the exception than the rule,” she said. Dr. Elisa Bandera, associate professor of epidemiology at Rutgers Cancer Institute of New Jersey in New Brunswick, said in an email to Reuters Health that maintaining a healthy weight, healthy diet and regular exercise likely has benefits for cancer prevention and survival. But she cautioned that these are only findings from one study. “We need more studies evaluating the impact of meat and other dietary factors on cancer survival before any recommendations can be made to cancer survivors,” wrote Bandera, who was not involved with the new study.